The line on the map from Albuquerque to Springerville looks straight, but we can assure our route between was not. The roads out here are definitely navigable, but there is nowhere to stop if you get a flat tire or run out of water. It doesn't matter. Everything is beautiful and nothing looks the same for more than 20 miles. 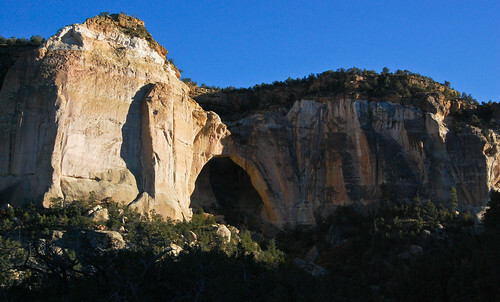 Today's trip took us through an underrated scenic area, El Malpais National Monument. Half of the land is on Indian reservations, but you can drive through easily. 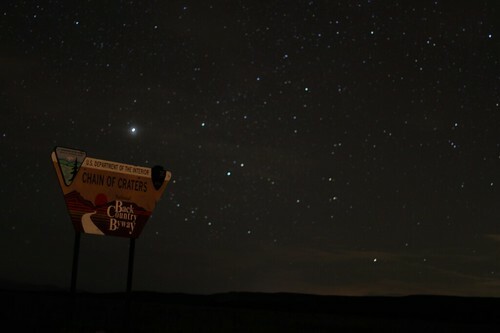 If anyone is driving out to the Grand Canyon, you should check this out on the way. The cyclists are trying to do four consecutive centuries (100 mile rides). So far, they are 2-for-2. Last night we camped out in a wide open prairie field at the foot of a ring of dormant (we hope) volcanos. It was the coldest night of the trip, 16 degrees, and everything was frozen in the morning. What fun! Nobody gives an explicative about what you do out in the Southwest, so we've basically been camping off on the side of the road at whatever the 100-mile point for that day is. It's fun mostly, except when a scary, Coen Brothers-looking pickup truck stopped next to our camp for about 5 minutes with its headlights on... then drove off. We took out our knives. We should have bought guns. Submitted by anonymous (not verified) on 04 04 2010 - 07:10. Submitted by bandcycle on 03 03 2010 - 15:28. Submitted by Dawn Elliott (not verified) on 03 03 2010 - 08:06. Hey guys I just heard on the Today Show that you can enter some contest with home video. Check it out. Maybe you can enter your footage and get on the Today Show and make it big!!! !